Real Exchange Rates, Devaluation, and Adjustment provides a unified theoretical and empirical investigation of exchange rate policy and performance in scores of developing countries. It develops a theory of equilibrium and disequilibrium real exchange rates, takes up the question of why devaluations are the most controversial policy measures in poorer nations, and discusses what determines their success or failure. In a lucid fashion, Edwards organizes vast amounts of data on exchange rates - both real and nominal - and discusses their effect on net trade balances, net asset positions, output growth, real wages, and rates of price inflation, analyzed both in time series and through cross country comparisons. 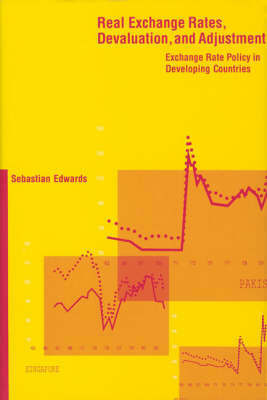 Edwards's investigation singles out 39 major devaluation episodes for before and after comparative analyses while simultaneously isolating the separate effects of other important explanatory variables, such as bank credit expansion and changes in the terms of trade. The first part of the book focuses on theoretical models of devaluation and real exchange rate behavior in less developed countries. Special attention is paid to intertemporal channels in the transmission of disturbances. The second part uses a large cross country data set to analyze the way the real exchange rate has behaved in these nations. The data are also used to test the implications of several theories of real exchange rate determination. The third part analyzes actual devaluation experiences between 1962 and 1982. These chapters examine the events leading to a balance of payments crisis and to a devaluation, exploring the relation between macroeconomic disequilibrium, and the imposition of trade and exchange controls. They also investigate the effect of nominal devaluation on key variables such as the balance of payments, the current account, the real exchange rate, real output real wages, and income distribution.